IBM® Cloud Orchestrator helps you go live as you develop and test applications with ready-to-use patterns and content packs that automate cloud configuration, provisioning and deployment. Automate setup and deployment of complex IT tasks—as well as cloud-deployed processes—using existing skills, processes and technology artifacts. Simplify deployment and management of middleware and application patterns. Coordinate tasks across heterogeneous compute, storage and network domains. Integrate management tools and implement multi-tenant cloud use reporting and executive cost dashboards. Manage cloud services from deployment to patch management and security compliance. Automate change management to help increase the integrity of cloud services. In addition, you can link service requests to asset and change management to improve quality of service and business resiliency. Customize the self-service portal to work the way you do. It is based on OpenStack and supports VMware, HyperV, KVM, Power, zVM infrastructures, Amazon EC2, IBM Cloud, Microsoft Azure public cloud and Heat Stacks. 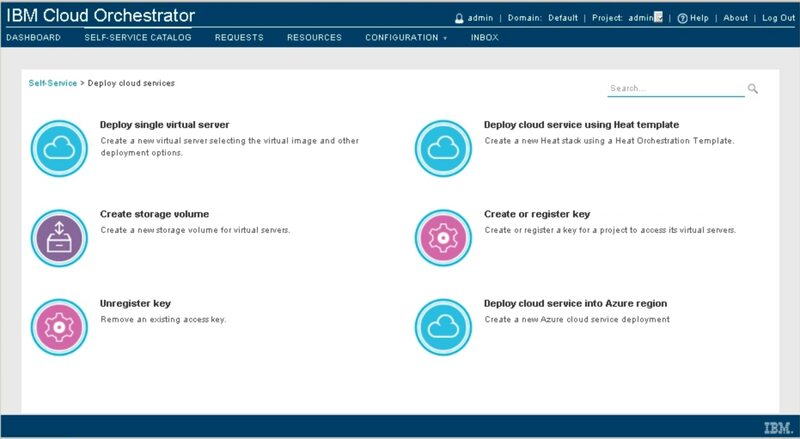 In addition, it provides APIs and tooling extensions to customize cloud services. You can also deploy not just servers, but multi-node applications. Choose to pay for licensing from a third party or use OpenStack technology. Adhere to stringent service level agreements using single interface to monitor cloud environment health and performance. Monitor both virtual and physical infrastructure, including network and storage resources. Also, cost management features display chargeback costs for the managed technology. In addition, use policy-driven workload placement to help optimize performance and security. Provision servers in minutes, reduce hardware costs by 300% and virtualize server environments..